I am home today roasting a bazillion plum tomatoes for a nibble I’m going to pass at my book signing tonight. There are sheet trays of tomatoes in various stages covering almost every surface in the kitchen (which is now thankfully a little less cluttered, as many of the 465 seedlings have gone to the farm garden). Bottles of olive oil, cutting boards covered with garlic slivers and thyme sprigs, and bowls of tomato seeds for the compost cover every other bit of remaining surface area. It would have been easiest to fix myself a peanut butter sandwich for lunch. But no, I had to get out the sauté pan, because I’ve been ogling the gorgeous asparagus I bought at Morning Glory Farm yesterday. Every year I look forward to these purple behemoths; they have amazing flavor and defy the spindly Chilean spears that haunt the fluorescent aisles of the grocery store. These asparagus—you can tell they grew in the dirt, broke ground one cold March morning, and burst onto the scene with the bravado of a groundhog. 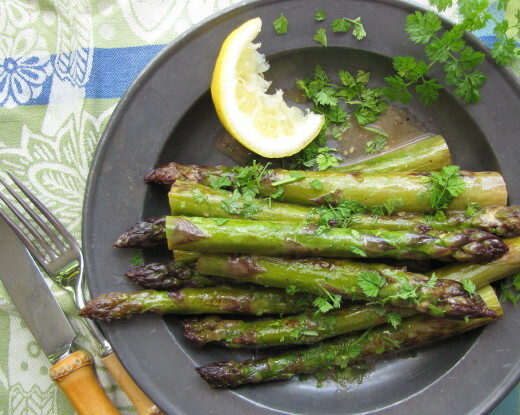 Actually, I was really glad I got the sauté pan out, as this whole recipe—one of my very favorite preparations for asparagus—takes, start to finish, less than 15 minutes to make. And the depth of flavor the vegetable gets from the browning, the quick simmer in chicken broth, and the finish of a little Dijon, butter, and herbs, is just astounding. (Okay, I realize that sounds a little boasty, this being my recipe. But if you make it and disagree, please let me know.) And for once, I got to eat the whole dish myself. Lucky me. This recipe was adapted from my cookbook, Fast, Fresh & Green. Combine the chicken broth and white wine or lemon juice in a liquid measuring cup. In a 10-in straight-sided sauté pan with a lid, heat the olive oil and 1/2 tablespoon of the butter over medium-high heat. 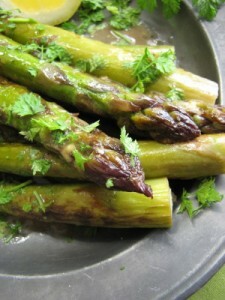 When the butter has melted and is bubbling, add the asparagus and salt and toss the asparagus well to coat. Arrange in one layer and cook, without stirring, until the undersides are nicely browned, 4 to 5 minutes. Using tongs, turn each spear over and cook, without stirring, just until the other side is beginning to brown, about 2 minutes. (If the asparagus are very thick, go one minute more.) Carefully (it will sputter) pour the liquid into the pan and immediately cover it. Simmer until the liquid reduces almost completely (1 or 2 teaspoons will be left), about 2 minutes. Uncover, take the pan off the heat, and add the remaining 1/2 tablespoon of butter, most of the thyme or chervil, and the Dijon. Stir gently with a silicone spatula to mix the mustard with the melting butter and to incorporate any browned bits from the bottom of the pan. Transfer the asparagus to a serving platter or plates and pour the pan sauce over it, scraping all of the sauce out of the pan. Garnish with the remaining herbs. Serves 3 (as a side dish) or 1 for lunch! The signing went so well and Libby was a really good sport to sit through the whole thing as I didn’t finish signing books until 9:30!! What a great kid you have! Hope you enjoy the asparagus.